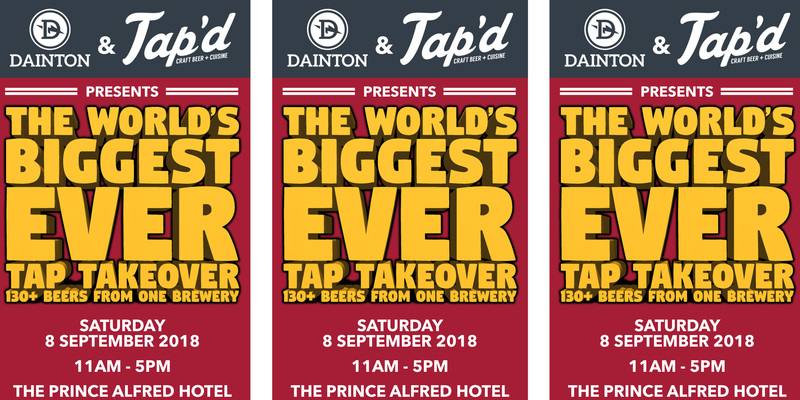 Dainton Brewing and Tap’d Craft Beer & Cuisine are set to present, the world’s biggest ever tap takeover. Dan Dainton and the crew at Tap’d Bar at the Prince Alfred Hotel, smashed their heads together and came up with the mother-of-all beer events. Simply make a truck load of beer, put them all on tap at the same time, and break a World Record while we’re at it, easy! On September 8 we will be tapping over 130 beers from Dainton at the same time, every different style and flavour imaginable. Food and non-alcoholic drinks will be available during the event, and we will have live music from local artists playing throughout the day. Beer stocks are limited so get in quick!